Ketamine is not a new drug. It is an anesthetic drug that has been used for decades in human and veterinarian medicine since it was introduced into clinical practice in 1970. When used in anesthetic doses it produces a complete loss of consciousness while retaining certain protective reflexes. This has made it an attractive choice for anesthesiologists in selective patients. Although it does stimulate opiate receptors, much like morphine, its NMDA receptor antagonism at subanesthetic doses is believed to be much more important in the treatment for chronic pain or psychiatric disorders. It blocks the NMDA receptor and prevents the passage of ions through the channel which interrupts pain signal transduction, giving the central pain center a chance to “reboot”. Often, this means the patient must undergo a series of low dose ketamine infusions for amazing relief or complete elimination of chronic pain. Ketamine Infusions are often used when other treatment modalities have failed. Specific types of pain that are considered “neuropathic” in origin have been studied the most and considered to be the most responsive to ketamine therapy. Patients are experiencing dramatic and miraculous results after only a few treatments. What does IV ketamine infusion therapy entail? Depending on the nature of your pain and your responsiveness to initial sessions, treatment protocols are individually planned. A variety of medications can be used including lidocaine, ketamine, and magnesium. Infusion cocktails are prepared at the Florida Spine Institute so they can be tailored to each patient’s therapeutic needs. These medication are generally mixed with saline in an IV bag and infused slowly over several hours depending on the protocol and medications being used. Most often, a spectrum of treatments will be suggested daily for a period of a week or more. The time period for pain relief following one or more ketamine infusions cannot be foreseen. Our goals is for patients to enjoy lasting relief that can be measured in weeks or months after their last treatment. Almost all patients who experience extended pain relief will need to have occasional booster infusions or to take low does intranasal ketamine at home. 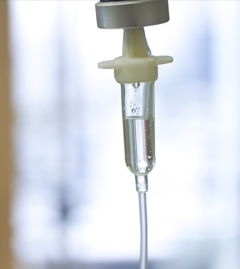 What are the risks of IV ketamine infusion therapy? Most patients receiving ketamine infusion therapy generally tolerate it well and very few patients need to stop treatment due to side effects. That said, ketamine is a derivative of phencyclidine (PCP) which a known psychedelic drug and if not combined with sedation medications can cause hallucination in some patients. To control this dysphoria, you will be given a benzodiazepine. Other possible side effects can include nausea and more rarely, a headache. Side effects can often be managed or completely eliminated during the infusion therapy. After the completion of an IV ketamine infusion therapy treatment, patients are often tired for several hours and need to be assisted home by a capable adult. No long-term side effects have yet to be observed that can be attributed to low dose intravenous ketamine infusion therapy. Unlike other common FDA approved analgesics like opioids, ketamine is not highly addictive. Analgesic Response to Intravenous Ketamine Is Linked to a Circulating microRNA Signature in Female Patients With Complex Regional Pain Syndrome. Complex regional pain syndrome: An optimistic perspective. Rational pain management in complex regional pain syndrome 1 (CRPS 1)–a network meta-analysis. Pain relief is associated with improvement in motor function in complex regional pain syndrome type 1: secondary analysis of a placebo-controlled study on the effects of ketamine. Outpatient intravenous ketamine for the treatment of complex regional pain syndrome: a double-blind placebo controlled study. Single i.v. ketamine augmentation of newly initiated escitalopram for major depression: results from a randomized, placebo-controlled 4-week study. Pharmacologic approaches to treatment resistant depression: Evidences and personal experience. Ketamine and Other NMDA Antagonists: Early Clinical Trials and Possible Mechanisms inDepression. R-ketamine: a rapid-onset and sustained antidepressant without psychotomimetic side effects.